The Northwest Florida State College baseball team gathered together on a sunny Friday morning for both team building and community service. Standing at the Choctawhatchee Basin Alliance (CBA) headquarters in Santa Rosa Beach, Florida, they faced a mountain of oyster shell waiting to greet them. In the next three hours, the team members would bag an entire trailer-full of shell and use it to build a brand new section of oyster reef in Alaqua Bayou. Located in the Eglin Air Force Base reservation, storm events and boat wakes have caused erosion along Alaqua Bayou’s banks. In addition to providing habitat for juvenile oysters and other marine critters, the oyster reef will block much of the wave energy and protect the shoreline. This reef will be the longest in CBA’s history, coming in at nearly 1,700 linear feet. After Gwin gave a brief explanation of bagging procedures, the Raiders set to work. They talked and joked as they bagged, and the clinking of shell reverberated across the South Walton campus. Though it was hot, the baseball team members worked efficiently. Once enough shell had been bagged, the team loaded it into the CBA trailer to move to the bayou build site. Forming a line, the guys passed the bags from one to another, creating another pile of bags before following instructions from Gwin on how to place them in the water. The reef is built using a pyramid-like structure; the very top of the reef is meant to show above the high-tide line, and can provide a resting space for a range of native bird species. 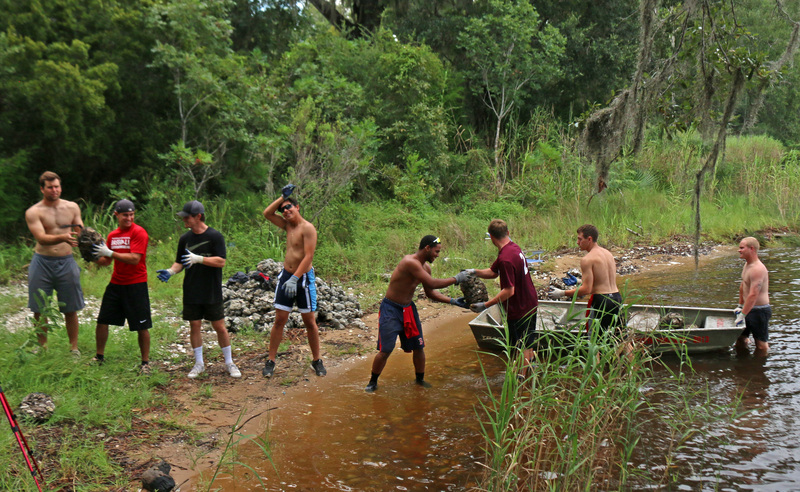 One by one the players waded in the warm water of the Choctawhatchee Bay to help with the bag placement, wiggling tones in the sand bottom of the bayou. The nearby coastline was beautiful, bright green leafed-out trees mixed with the deep evergreen of pine trees along the shore. A chattering Belted Kingfisher darted across the calm surface of the bayou, while Great Blue Herons watched from their nearby hunting grounds. 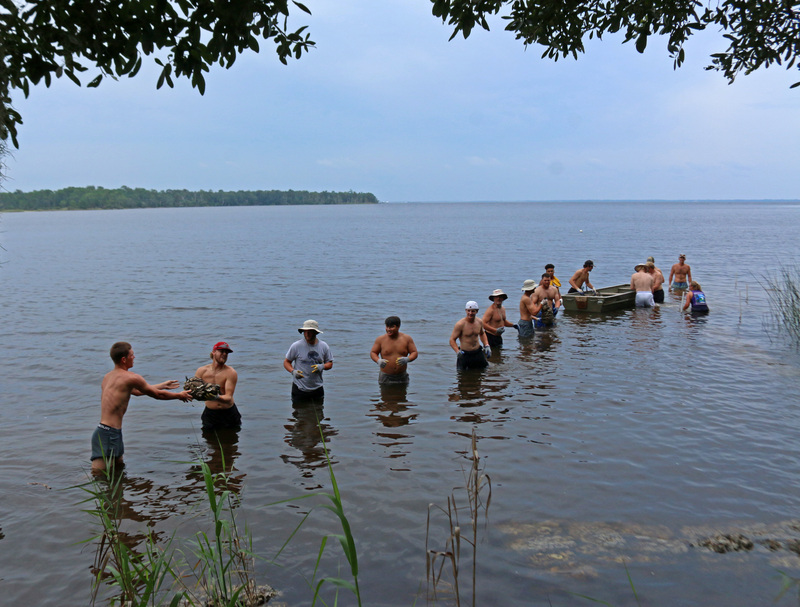 By the time they had finished, the NWFSC baseball team had successfully built a section of brand new oyster reef. In addition to pursuing their academic studies and continuing to practice for the spring season, the boys plan to attend additional reef building activities in the future!